Now is Right On Time! Not long ago I was wrestling with an inward struggle that wouldn’t let up. I tried to ignore it for months. I allowed several different seasons to pass before I was willing to slow down enough to listen to myself. I finally took the time to listen and I have to admit I am very happy with what I heard. I love my children and would do absolutely anything for them. Most anyone that knows me can attest to this. Right after I received my bachelor’s degree in 2006 I was going to continue straight through and complete a master’s degree also. I had a difficult choice to make because that’s also right at the time my children were both starting to get heavily involved in sports. These young years from 8-14ish are when us dads get a chance to coach our kids in various sports before the middle school and high school coaches take over. So, I made a conscience decision to put off continuing my education in order to be available to coach my two amazing children. I’m not saying for one second that I regret not continuing with my schooling. I cherish every moment I got to spend with my kids in their various sporting activities. On my birthday, though, something clicked. It had been deepening in me for months. My internal frustrations were growing and I was feeling like a seed that is planted and is ready to sprout through the ground any second. Those internal frustrations were starting to affect my family too. I was overweight, grumpy, and just frustrated with my life. So when I sat down to that blank page, apparently I had a few things I needed to tell myself. In no time flat I had wrote down that I either needed to start writing a book or go back to school. It was one or the other. Both of the kids are in middle school and coached by school-appointed coaches now so there is no excuse for procrastinating. I decided I would look into a few programs around the area (Western Michigan, Davenport, Phoenix, Spring Arbor, etc). I also determined to sit with a couple book ideas and see which direction my heart was really leaning towards. By that evening I had filled out an application for Spring Arbor University to enroll in their online Masters of Communication degree program. I’m currently starting my fifth week in the program and I couldn’t be happier where I’m at. Some days are pretty hectic and difficult but I’m one step closer to achieving my goals. 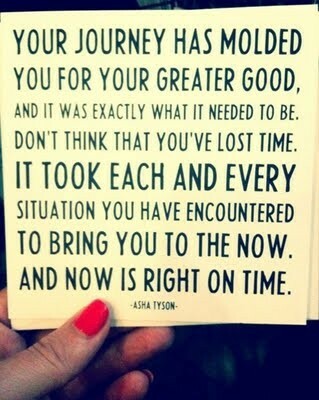 Knowing that “Now is Right On Time” is a great feeling. I’m so thankful I took the time to listen to what my heart wanted me to hear. I’m right where I’m supposed to be on my journey and I am molded to who I am supposed to be. What is your heart trying to tell you? Here is to the future Master Travis 🙂 Congrats on starting, seems like that is half the battle. that is terrific!! The pieces fall in place! Love that you share your thoughts Tavis. May your journey to a Masters be guilt free and fulfilling! I will be reading along. God Bless!